Twin Birthright(Birth Attribute) Player is born with a Sibling attached to them. The Sibling may learn Techniques and one Chakra Element.The Sibling will be considered the weaker one so it may only reach up to level 50;The Twin can create its own Base Chakra/Stamina. Distribution Rules Apply. Evil Spirit Separation (25 Chakra from one Twin,passive)Dodge All Techniques- Separates from the Other Twin, Both Siblings now have their own moves per turn limit. Evil Spirit Fusion (25 Chakra from one Twin,passive) Rejoins with other Sibling. Must be on the Same Square when using this. Still considered as two targets. Requires Evil Spirit Seperation to have been used. Parasitic Ghost Merge (150 Chakra) Fuses with one opponent. 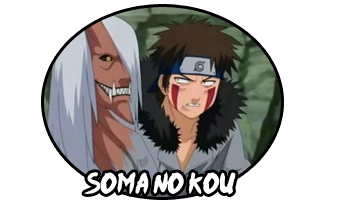 During this Fusion, The Affected can only damage the Twin by Inflicting Any self damage and/or death or D-Taijutsu.The Merging Twin can only use Soma No Kou Techniques while merged. The Affected and Merged Twins cannot be healed of any effects/damage during this time.Affected Cannot Escape while this is active. All Non Soma no Kou Damage /Debuffing/Holding effects also effect Merged Twins.Last Three Turns per twin Attached. once every Five Turns per twin after Duration Ends. Inevitable. *Cell Decimation (50 Chakra) 50 Life and 25 Chakra/Stamina Damage to Affected. Inevitable. cannot be modified. *Parasitic Ghost Release (100 Chakra,passive) Ends Effects of Parasitic Ghost Merge. *Protein Demolition (100 Chakra) Absorbs 150 Stamina from the affected. inevitable,once per every post per Twin. cannot be modified. *Chakra Siphon (100 Chakra) Absorbs 150 Chakra from the affected. inevitable,once per every post per Twin. cannot be modified. *Burning Organ Infection (200 Chakra) Poisons 50 the next Eight Turns,inevitable once per Merge and Twin. *Parasitic Ghost Destruction (300 Chakra) 500 Life/Chakra/Stamina Damage to the Affected,Inevitable. Becomes an Obliteration Technique if The Swamp Form of a Curse Seal is Active. Once per Twin. Can only become an obliteration technique once. -Twin Birthright:the Twin may Own an Expertise. May Not Own:Fighting Style,Weapon,Items,Armor,Energy Amplifier. The Twins share those. -When Twins Split, Fighting Styles,Armor,Energy Amplifeirs apply to both of them. Users must determine which Twin carries Weapons/Items. -The Twins must be joined together in order to use Multiple Connecting techniques. -The Twins are still 2 targets when joined together. -While joined together, the Twin may use techniques during the main player's turn by using their skill slots. -While joined together, please label how much Life/Chakra/Stamina the other twin has every turn. -Twin does not instantly restore Health/Energy after joining with the Player. -User or Twin is not Cloned when either one makes a clone of itself. Clones cannot use Parasitic Ghost Merge. Leveling the Twin The Twin Levels with the User until it reaches level 50.